Decorating soldiers’ graves with flowers is an ancient custom. We’ve done this in the United States since before the Civil War. Decoration Day was officially established soon after the Civil War ended and observed on May 30 because flowers would be in bloom all over the country. Memorial Day became a national holiday in 1971 and moved to the last Monday in May. A gray, cold day – It’s hard see the end of these graves, and more difficult to imagine the suffering. Arlington National Cemetery is the final resting place for more than 400,000 active duty service members, veterans and their families. 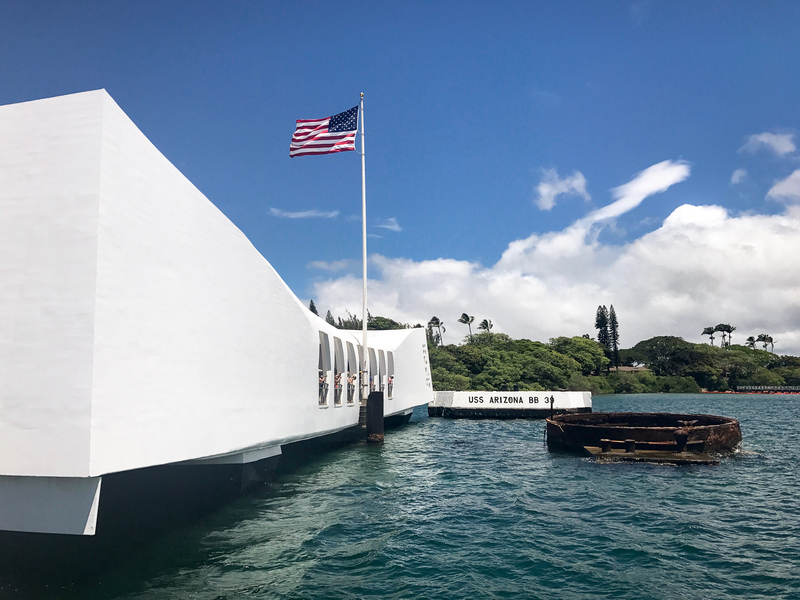 The USS Arizona Memorial in Pearl Harbor, Hawaii – The resting place of 1,102 of the 1,177 sailors and Marines killed on USS Arizona (BB-39) during the Japanese surprise attack on Pearl Harbor on December 7, 1941. It commemorates the events of that day. This photo ©MK Rosack, 2017, used with permission. 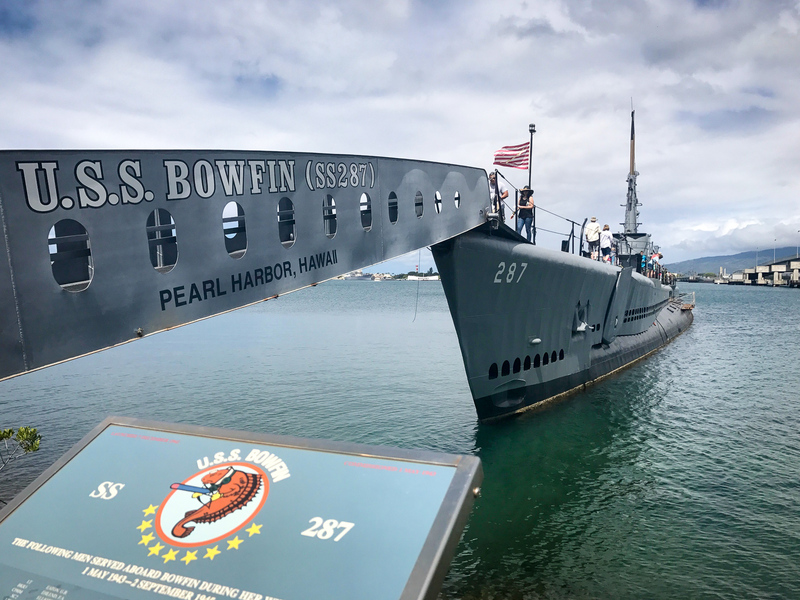 USS Bowfin (SS-287) Memorial, Pearl Harbor, Hawaii. The Bowfin made WW II patrols and supported the Korean War. It’s open to the public as a museum and park and became a National Historic Landmark in 1986. This photo ©MK Rosack, 2017, used with permission. Thanks for stopping by and reading my blog. Please, take a few moments tomorrow to remember those who perished, and those they left behind. Heroes all. I took a quick sunrise trip to Jetty Park yesterday morning with fellow Photography Interest Group member Keith H.
The sky was pretty cloudy when I first went out, but by the time we arrived it was starting to clear up. There was still enough color left to get a few good photos. In this one, I like the way the light on the walk draws my eye to the bottom left and then the rail and the jetty lead to the sun rays coming up from below the horizon. A little later, I noticed this boat speeding around the inlet, sometimes with flashing lights and a siren and wondered what was going on. The Coast Guard patrols: This small Coast Guard patrol boat was very active. On the way out: Close up of a ballistic missile submarine leaving Port Canaveral, Florida. The presence of bow planes instead of sail planes show that this is a British boat, the HMS Vigilant. This was pretty exciting for me. Many years ago, after college, I was in the Navy and served aboard a sub like this one. Just before I got out, I was stationed at the Naval Ordinance Test Unit at Cape Canaveral. After submarines go through refit, the Navy sends them down to NOTU for a missile test. They load a special dummy warhead missile and then test fire it down range from the Atlantic off the Cape. The tall mast behind the sail is added to transmit instrumentation data during launch while the sub is submerged. We watched the boat turn south after leaving the inlet, and rushed to set up our cameras for a photo as it sailed under the sun. Submarine sunrise: This is a unique Florida sunrise scene: The British Trident ballistic missile submarine HMS Vigilant leaves Port Canaveral, Florida just after dawn. We hung around for a while after this to photograph shorebirds including Brown Pelicans, Gulls, Black Skimmers, Terns, and others. But the highlight of the trip for me was the sub. As a former submariner, it brought back a lot of memories and I really enjoyed the show. Quite a bonus for getting up early! 10/31/12 update: The HMS Vigilant successfully launched a Trident II D5 missile on 23 October. Read more here (sorry, no longer available).